The main figure in this image is Hasebe Nobutsura, a loyal retainer of Prince Mochihito. 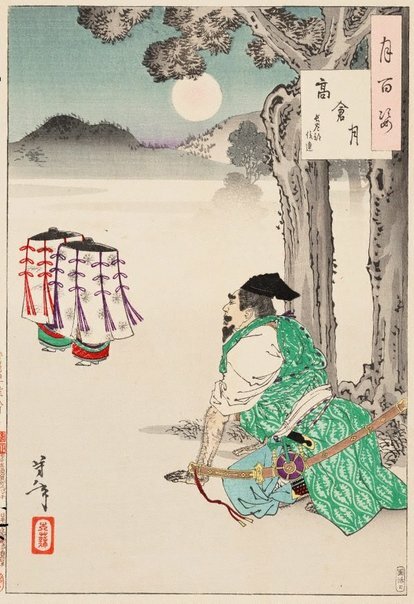 After having unsuccessfully plotted against the powerful Taira family in 1180, Mochihito was forced to flee from his Takakura mansion outside of Kyoto. Nobutsura cleverly had Mochihito and his companion dressed as travelling women, wearing wide-brimmed hats and all-concealing veils. Here, Nobutsura watches the fleeing prince before returning to defend his lord’s mansion.